“Reports from numerous sources have been published regarding the terrorist plot targeting the National Council of Resistance of Iran convention in Paris indicating an Iranian regime diplomat working in their embassy in Austria by the name of Asdollah Assadi was the mastermind behind this terror attack. The European Union has more than anywhere across the globe suffered from these atrocities. “In the last decade of the 20th century a wave of assassinations and terror bombings against the mullahs’ political dissidents in Europe increased to such an extent that, in protest, the European Union expelled all of the Iranian regime’s ambassadors and recalled its ambassadors from Iran. This serious and firm measure forced the Iranian regime’s to pledge to the Europeans such measures will never be repeated on European soil. 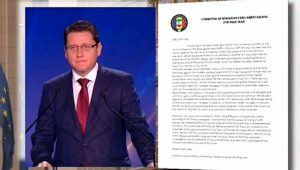 Receiving this pledge the European Union reestablished its diplomatic relations with the Iranian regime. However, Tehran’s policy in regards to exporting and supporting terrorism has not changed and will continue as long as this regime is in power. “The recent terror plot in Paris, with 500 grams of explosives, is a new and unprecedented level of state-sponsored terrorism. 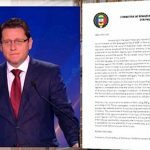 Similar statements were also issued by “In Search of Justice,” a European committee with over 4,000 MPs, as well as Italy’s Committee of MPs and Citizens. Meanwhile, regime President Hassan Rouhani went ahead with his visits to Switzerland and Austria, choosing to expend his efforts in an attempt to save the Iran nuclear deal, or Joint Comprehensive Plan of Action (JCPOA), and the regime’s future business deals despite impending sanctions due to the U.S. withdrawal from the JCPOA. Rouhani decided to ignore the foiled terrorist attack, despite the fact that an Iranian diplomat in Austria was arrested in Germany in connection with the plot. Rouhani also chose not to acknowledge that the recent terror plot took place alongside continuous terror threats by agents of the Iranian regime against MEK members in Albania. The failed plot at the NCRI gathering was a convention attended by 100,000 people, many of whom were members of the MEK. While the regime visits Europe asking for the EU to continue to finance its activities through business dealings, back at home it works to suppress its people. It sends its agents to silence those who leave the country and tell the world of its corruption. The regime has shown it will do anything to stop the MEK, or failing that, to slow it down, including using diplomats to carry out terrorist missions. Europe should be “ashamed” of itself for continuing to work with the Iranian regime. The Iranian people deserve a government that does not use its diplomats to murder the opposition. The international community does as well. The EU must reimpose sanctions. Not doing so constitutes approval of their actions.